Noctiluca is a dinoflagellate commonly known as "sea sparkle" because it exhibits bioluminescence when disturbed. This free-living, non-parasitic species is found in the marine environment. Noctiluca devours food that includes plankton, diatoms, other dinoflagellates, fish eggs and bacteria. This species is commonly found along the coast, in estuaries, and shallow areas that receive plenty of light which promote the growth of phytoplankton, which is a primary diet source for Noctiluca. Samples were collected at Fort Worden in Port Townsend, Washington, USA by Ashleigh Pilkerton and Lilianna Wolf for the Port Townsend Marine Science Center (2015 Citizen Science Program). The image and video below were captured using the DCM3.1 microscope camera (3.2 megapixels) and a Zeiss Phase Contrast microscope. 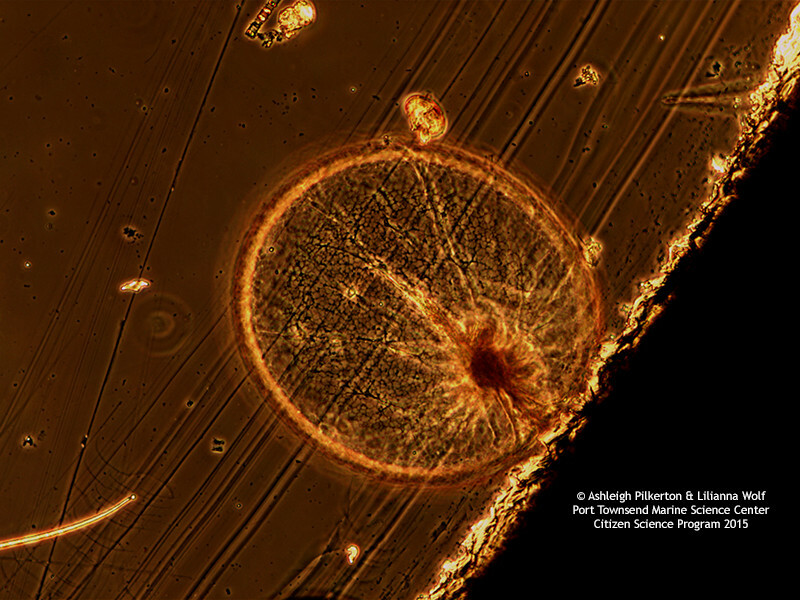 Noctiluca Protoperidinium captured under the microscope.